1. Went to Beijing with Mr. O Sing Pui to help out photographing his documentary "Red Memories". 2. 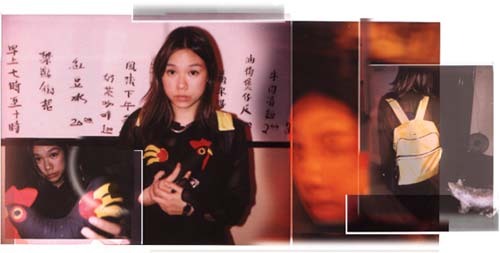 Cheung Wai Hung’s second independent feature film "Among the Stars", acted and art directed. It’s a serious, romantic, poetic movie, on a deeper level about love. 3. "Short Film by Gill" a nine-minute video filmed and edited by myself. Walking movie instead of road movie. Everybody is going somewhere so I followed some, I picked some with bright colored clothes or limping people. 4. Yau Ching’s "Unchanged" – current project. I am art directing for this independent film set in Hong Kong about the near future. Art directing the costumes too. And it’s cool because I get to work with very super people in the crew like Venus Lai, a powerful and magical fashion designer. Apart from working in the New Year, it is really fun. Kum Kwok Leung and Sam Lee are playing, exciting passerby’s and I get to dress them! 5. Being photographer for Chalk’s photoshoot this month! Is filming what you dreamed of doing as a kid? Why the move to movies? I still love old Avant Garde films. It wasn’t categorized as much then. It has not been brainwashed by Hollywood maybe. Have you seen Stan Brakhage? Once he got different layers of films and juxtaposes them. He would cut out wings, legs and bodies of insects and stick them on the film, edit it, and play it back. For half an hour, you see just flattened layers of insects and stuff projected and rushing through the screen nonstop. Amazingly beautiful. Do you find Hong Kong to be a discouraging place for creative people? Yesssss ss s. You can’t source any great experimental stuff, that’s why you have to look within yourself, it should be about originality, which, sadly, Hong Kong does’t believe in. But you still get inspired walking on the streets, like old men dressed in these fake leather pointy business shoes with short see-through stockings. Like Yau Ching’s film "Unchanged", we do not have a budget, but it’s set in the future. The solution is to mix things and times, and strange consequences have resulted. The idea that the future will have a different perspective on things is really a happiness. For example, imagine plastic bags will not be produced legally anymore and thus evolved into a luxury handbag item while LV bags are the cheap and unwanted consumer goods. Have you thought of being in front of the camera and taking on acting? I’ll probably be shy unless I could be myself, or the psycho woman (I couldn’t tell the difference). I studied psychology because I wanted to test humans. (laughs) However, I am doing a different type of testing towards human now – that is in the visual sense I mean. I want to buy a whole lot of musical instruments and equipment, and spend all my time making music. I love percussion, and the double bass. Music is more instant, whilst film has more layers and location. Anything you wish to say to our audience?